We are one of the leading manufacturers and suppliers of a wide range of Safety Aprons. We have made our range in compliance with industry standards. The product range includes Reflective Jacket Apron, Leather Apron, Leather Apron Deluxe, Cotton Apron, Rubber Apron and many others. These aprons are widely accredited for their smooth finishing, durability, soft textures and reliability. 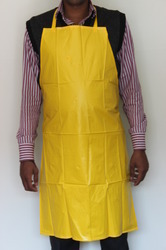 Clients can avail an exclusive range of Disposable Apron from us. These aprons are made using premium quality fabrics and advanced machinery tools. We make sure that each product offered by us is free from any defect and therefore our quality inspectors sternly check them on set quality parameters. 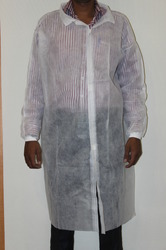 These aprons are widely used in restaurants, research labs, hospitals, food industries and many others. 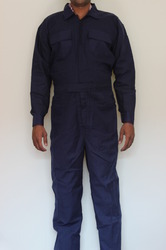 Dangri/Boiler Suit offeredcan be made available in superior fire resistant heavy fabric finish which makes these highly suitable for use in different industrial applications. Further, these also come with superior arc rating protection support. Some of its features include comes with support of concealed two-way brass zipper support; single piece, topstitched quality; hemmed sleeves; comes with support of front pockets, chest pocket; side vent openings and others. 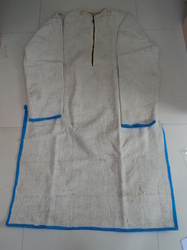 These are the simply fabricated aprons which are coming in plastic materials. 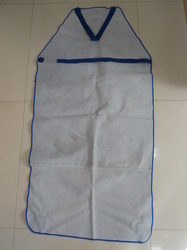 Plastic Apron is available mostly in the market in white and blue color in the packing of 100 nos. Asbestos Apron is the cloth which is available in the lots of variety like mixing textures, soft thickness, and fire-resistant. They are usually made by the Thermal Insulation system. We have gained vast industry experience in the field of manufacturing and supplying an extensive range of Leather Apron Delux. These aprons are fabricated using best quality raw materials and pure leathers and in adherence with the industry standards. Entire range of our products is well analyzed and checked by the quality experts, who have in-depth knowledge on their respective domain. We offer our range at most feasible rates. 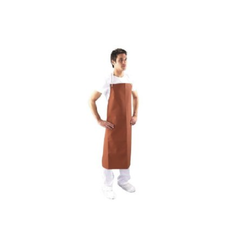 Rubber Apron offeredcomprise quality finished PVC aprons that comes developed using cotton fabric with PVC coating so as to provide for suitable usage in different working environments. These are also eco-friendly to use and can be provided in options of different finish sizes like 40*60 cm as well as in other customized options. Some of its features include suitable for use in areas like labs, industrial workspaces, and others; made of waterproof PVC fabric; can be provided with coating support of PU, PVC; superior stitched finish. 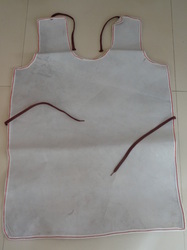 We offer Safety Leather Apron to our valuable customer and our product is made of good quality. 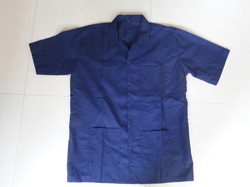 Leveraging on our vast experience, we offer our clients Shirt Apron (Grey Colour) in superior quality. All our offered range of products has been made using the best technology. They are specifically designed and user can use them very conveniently and confidently. 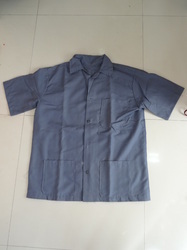 We offer Shirt Apron (Grey Colour) to our customers as per their needs in order to satisfy them. Our product is available in reliable in nature, robust in construction and known for their long functional life. Besides these, customers can avail this product from us at affordable rates. 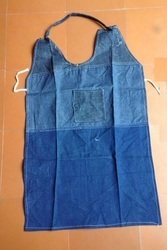 Jeans Apron offeredcome constructed in flame retardant denim fabric/cotton denim so as to provide for high safety during working in demanding industrial process handling areas. Further, these aprons also come with superior abrasion pilling resistance and can also be repeatedly washed and used. Some of its features include safe to human body; soft finish that provides for high wear comfort; suitable for use in areas like metallurgy, machinery, fire fighting and others; offering superior moisture-absorption. Our organization is an applauded name in providing Dangri with logo printing to our customers. We accomplish this with use of best printing methods and excellent color combinations. The rich texture and vibrant colors make the logo prints quite appealing. It is made as per the specific choice of our patrons from across the market. We are noted for accomplishment of this as per the instructions given to us by our customers. Lastly, we are providing Dangri with logo printing at feasible rates to our customers to make sure that their demands are completely met from our end. 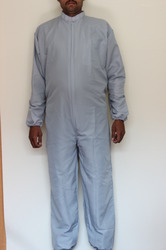 Paint Suit offeredcome in quality construction finish and are developed in material options like polypropylene spunbond nonwoven fabric, combination of polypropylene spunbond nonwoven fabric and meltblown among others. 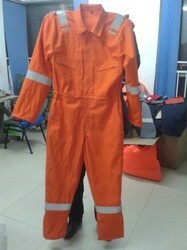 These suits provide for high safety and wear comfort and can be made available in different size options to pick from. 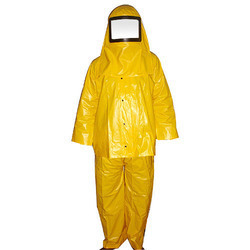 Some of its features include providing use as disposable coverall; developed using high-performance isolation protective material; option of OEM construction.